Thanks to you, the artists at NIAD have the opportunity to develop their career as an artist. Being an artist is not easy. For anyone. It’s a risky career path. Most artists cannot support themselves by art sales. Many have another job or a source of income that pays the bills for necessary things like rent, food and, of course, art supplies. Most of our staff are artists, so we understand the compulsion to choose a career basedon the desire to connect to others through something we create. Space to work, art supplies and supportive mentors are here to encourage, nurture and ensure that our artists’ stories will be seen and heard. You know this and have seen the progress. And all of us have seen the art becoming stronger, the artist becoming more self-confident in making and talking about their art. Through making choices, practicing different mediums and taking risks, a unique style develops. A style that is easily identifiable as a distinctive person. One that is recognized by others as a significant achievement. We celebrate this acclaim, since it is rare that it happens for any artist. Last year, several NIAD artists earned national acclaim for their work. Last December, Karen May was recognized by the national publication Artsy as one of nine emerging artists to watch. The attention was focused on her re-purposed Art Forum ads (shown by New York’s White Columns). These détournements are just a small part of Karen’s work, but they certainly reflect the critical belief that her additions are worthwhile. But what happens in the studio is not always about national acclaim or, even, sales. It is also the personal development that happens when people get to make choices about what they do. It is seeing the pride as someone notices something unique or the work is exhibited in a gallery for the first time. It is the quiet confidence in the ability to control everything necessary to have the art reflect the intentions of the artist. You are needed to ensure this development happens for every artist at NIAD. Your dollars, your visits, and your art purchases are necessary for each person in the studio. 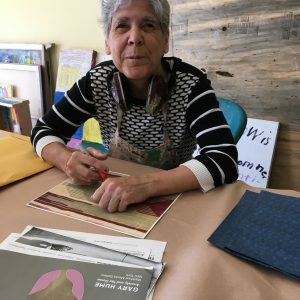 In this very busy world with many inequities, NIAD artists are able to create a personal space that thrives on creativity, connections and community. You are invited to visit, to see exactly how your donation helps us support each artist. Come in and make your own connections. Your donation not only buys paint and materials; it also contributes to personal growth and increased opportunities for every artist in the Art Center. As we near the end of this year, we need your support now. Please give today – whatever you are able to give — dollars or time. Ensure that the unique stories continue to be shared and our community expands. You can easily donate online. Thank you for your past donations of attention, money and time.